Tongues. We all have them. And while most of us just use them for talking and tasting (and a little kissing…), they’re capable of so much more. We should stop taking them for granted quite so much. Tongues are actually great indicators of poor health. Really! Take a quick look in the mirror at yours. How does it look? Nice and normal? Like everyone else’s? Good. Great! Well done, you’re probably quite healthy. But if there’s something up. Something unusual – you may need to seek medical attention. 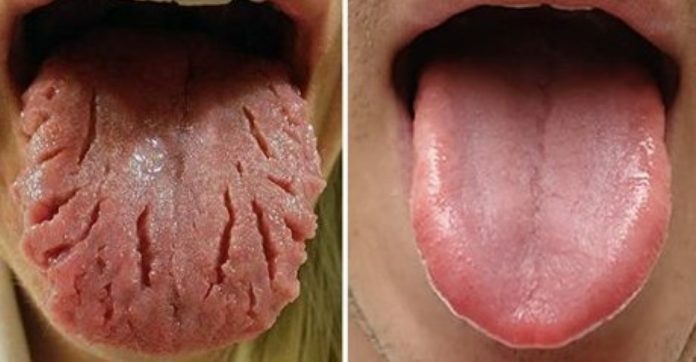 Here’s a gallery of some of the most common health issues that your tongue can tip you off about. WARNING: Some of these are pretty gross, so if you’re eating – stop for a minute, huh?! Yellow cottage cheese look – oral infection or thrush. 2. White patches = Leukoplakia. An oral cancer – consult your doctor IMMEDIATELY. 3. Wrinkles/cracks = Aging. Nothing to worry about, but maintain oral hygiene to prevent problems relating to the cracks. 4. Purple coloring = Blood circulation problems. 5. Hairy ‘black’ tongue = Ligua Villosa Nigra (a bacteria that’s not life-threatening). 6. White with a slick film = Poor oral hygiene. Start brushing more. And concentrate on the tongue. 7. Smooth red tongue = B12 deficiency. 8. Looks like a strawberry = Scarlet Fever. Rare. So see your doctor. Seen one you recognize? Get down to the doctors! Find Out Why This McDonald’s Window Has Got EVERYONE Talking!